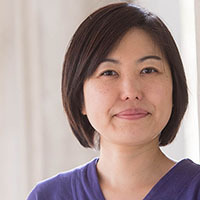 Miki started her role as the Research Manager at the Bioimaging facility (BIF) in February 2018. Miki has a B.A in Biology from International Christian University in Tokyo, and a MSc in Biological Sciences from University of Tokyo in Japan. She moved Australia to join Geoffrey Wasteneys lab and later in UBC for her PhD in Plant cell biology. She studied the role of cortical microtubules in cellulose biosynthesis and cell wall formation during plant cell expansion. Through her PhD and postdoctoral research, she gained skills in both optical and electron microscopy techniques. During her postdoctoral research in UBC, she started to offer the imaging workshops. She is happy to share the imaging tips and techniques that might help your imaging project. Miki teaches the Microscopy course (BIOL448C/BOTA546B), which provides both theory and practical hands-on experience on light/fluorescence, confocal, and electron microscopy (not offered in 2019 due to the move).